According to a statement released by WBC president Jose Sulaiman, the organization has reviewed the video of last Saturday's light heavyweight clash between Bernard Hopkins and Chad Dawson and decided to overturn the initial ruling of the 2nd round TKO victory in favor of Chad Dawson, instead declaring it technical draw. With the decision, Hopkins will retain his WBC light heavyweight title. Check out Sulaiman's entire statement, including clarification of their rules regarding injuries and fouls. 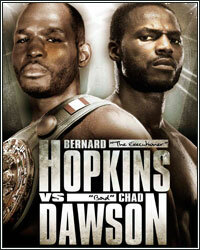 In regards to the championship defense of the lightweight WBC world champion between Bernard Hopkins and Chad Dawson, held in Los Angeles, California, in which the referee declared a TKO2 against champion Hopkins, as he could not continue due to an injury after a push by challenger Dawson, the head offices of the WBC sent videos, medical reports, and the WBC corresponding rules to the Board of Governors, that unanimously declared a technical draw on the fight; therefore, Bernard Hopkins is still the WBC light heavyweight champion of the world. The California Hospital Medical Center report was also considered by the Board, which states "Bernard Hopkins has been released from the California Medical Center in Los Angeles after being x-rayed and examined by Dr. Sam Thurber, MD who diagnosed Hopkins with a separation of the acromioclavicular (A-C) joint which connects the collar bone and shoulder blade." The WBC considered that point 29 of the rule WC-34, related to fouls was violated: "any rough tactics other than clean punches," covered the ruling of the WBC. Article WC- 33 was also considered: Body Fouls - except as provided below, there will be no disqualification for fouls to the body. The referee, at his discretion, determines that there was a foul and the ring doctor determines that the fouled boxer cannot continue, the offending boxer will be disqualified. If the doctor determines the fouled boxer can continue fighting but he does not continue, he will lose by abandonment. The WBC respects and cannot intervene in the decisions of the boxing commissions where the fights happen, but it does intervene in regards of the recognition of a WBC title of the world, by being the exclusive owners of the trademark and championship accolades  we hope that the California Commission will review our ruling on their next meeting in December.